The flows on the Gunpowder are at great levels at 91 Cfs, and a gate change yesterday released more cold water. A slight increase in flow from the bottom is negating the warm spillover, so temps are down in the 56-58 degree range in the upper miles of river. Yesterday I wet a line down at Sparks Rd and the water temp was 65 degrees at 3 pm. The Gunpowder has over fourteen miles of fishable water, and wild browns looking for a meal. In the different sections of river anglers will encounter different hatches. In the upper sections the sulphurs are still hanging on, but the action is very late in the evening. 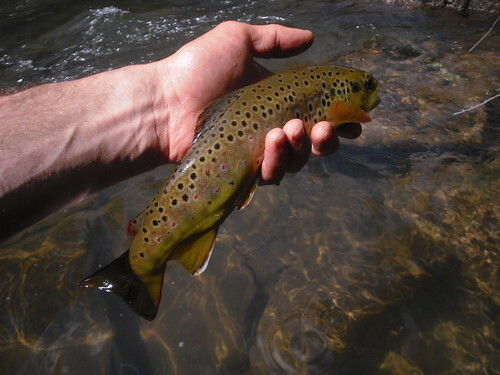 A few anglers mentioned seeing an emergence midday on Thursday, and trout eating the duns. Tricos are starting to appear in small clouds by 12 pm, but not in the big numbers we will see later in the Summer. Blue wing olives can be seen even on bright days, but the cloudy, rainy days are the best for this hatch. In the middle-lower sections of river there are stonefly shucks on the rocks and light cahills hatching. Terrestrials are already catching fish, and flying ants are working under overhanging branches. Streamers are also a great way to search for larger trout, especially in the lower sections of the river. In the latest video post I filmed a light cahill, BWO spinner and a sulphur spinner with egg sack attached. I also included a minute of rising trout that can be found along miles of river. The rising trout may not be big, but for dry fly enthusiasts there are plenty of fish working the surface during the day. This entry was posted in fishing report, video on June 12, 2010 by Jason du Pont.